Homepage > News & features > France > Air Pollution: Is Paris Gasping? And the rest of the world? Air Pollution: Is Paris Gasping? And the rest of the world? The Eiffel Tower beckons from a distance as we drive in to Paris on the motorway from Normandy. Her graceful shape will never cease to give me that moment’s thrill when approaching – the same thrill I had when I first arrived in this city decades ago. However, now when we drive in we see she’s sort of lost her legs, she’s up to her waist in it, fading fast. Mist. And the panels above the motorway warn us to slow down. Mist is magical, but the romance ends when you’re told it’s really PM2.5, PM10, NOx and NO2 – polluting particles, nitrogen oxides and dioxides – all of which hides a sword of Damocles over this otherwise beautiful capital. Eiffel tower surrounded by smog. Credit PA.
Last month France was condemned by the European Court of Justice for not respecting pollution regulations: more on this below. Meanwhile, let’s take Paris first, and see how it compares with a seclection of other cities. When it comes to pollution there are no frontiers. By evening after arriving in the city, our eyes are itchy – as they were the last time we were here, and the time before, and the time before that… And the tiredness kicks in. This has become a pattern over the last few years, and is one of the reasons why we stay more often up in the Norman fields. 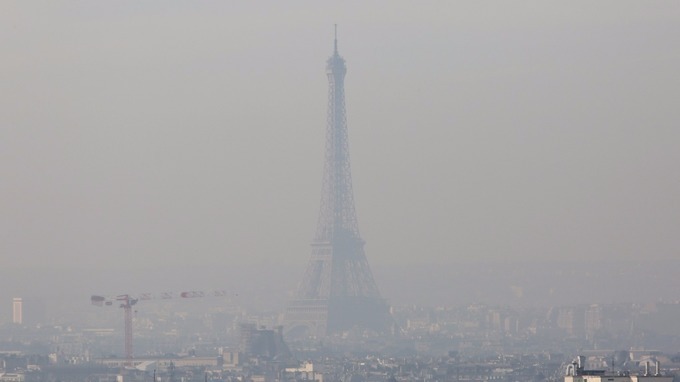 Paris has been once again rapped over the knuckles for its high pollution levels. 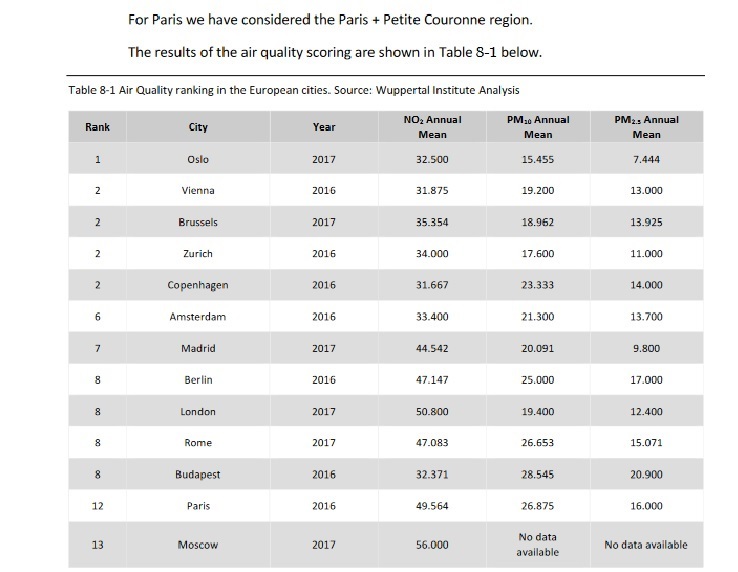 A report* published last month by the Wuppertal Institute for Climate, Environment and Energy for Greenpeace shows Paris ranking as the second worst polluting European city in a list of 13. Source: “Living. Moving. Breathing. Ranking of European Cities in Sustainable Transport”, report of the Wuppertal Institute commissioned by Greenpeace, 22 May 2018. 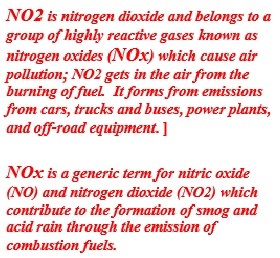 Note that NO2 is nitrogen dioxide, one of a group of highly reactive gases produced by vehicles and other combustion engines. PMs = Particle Matter, dust matter in different densities which pollute our lungs and get into our bloodstream bringing on potentially fatal diseases. True: the capital is denser than the others mentioned in the report, with an urban density of 21,000 inhabitants/sq. km. And let’s not forget that Paris is situated in a basin where air gets trapped. If that’s is no excuse, it does mean that the clean-up task is perhaps more difficult. The report rings alarm bells and particularly about the Greater Paris area (see Les follies de grandeur: Paris a rival for London, Berlin?) which could potentially exacerbate the problem with more people spreading fumes driving in from the suburbs. The Wuppertal report points out that even if the annual PM levels for Paris fall within EU standards, they do not fall within the more strict WHO guidelines. In fact when it comes to NO2 (nitrogen dioxide pollutant) levels, Paris exceeds both EU and WHO guidelines. A growing number of cities and towns worldwide are reporting their air pollution levels to WHO’s ambient air quality database. Statistics come from more than 4.300 cities in 108 countries – an additional 1000 cities have provided figures to the database since 2016. Check in here on the data base and see whether your city is reporting and how it compares to others. 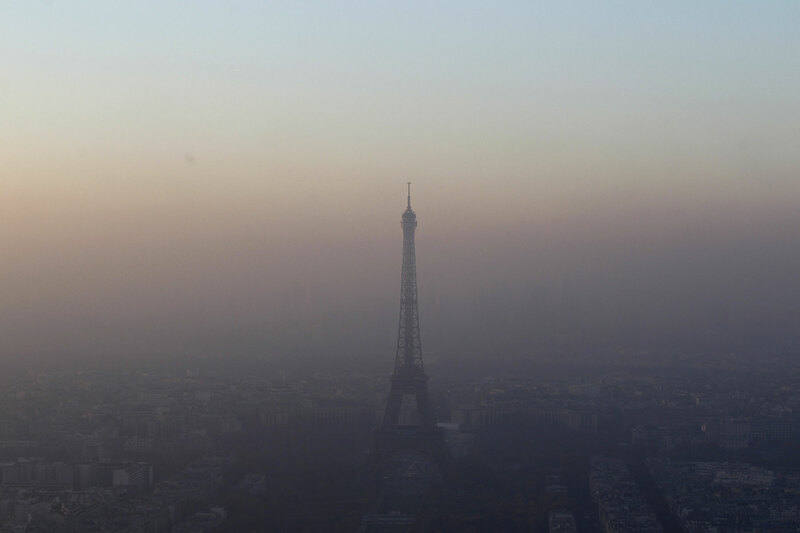 Paris’ air was already highly polluted in 2014. PMs, otherwise known as atmospheric particulate matter, is microscopic solid or liquid matter suspended in the atmosphere. Sources can be natural (e.g. volcanoes, fires) or man-made (e.g. fossil fuels in vehicles, power plants). 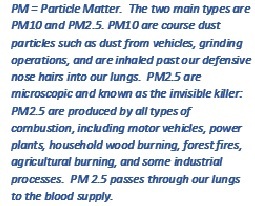 Source: data taken from WHO urban air quality database. According to the WHO database, the cleanest recorded city is Muonio in northern Finland (no surprise: it’s in the Arctic Circle!). Cities in Poland with its coal industry, and in Bulgaria, are the worst European air polluters. Nor does Italy fare well (Padova, Settimo Torinese, Leina, Ceccano, Soresina). 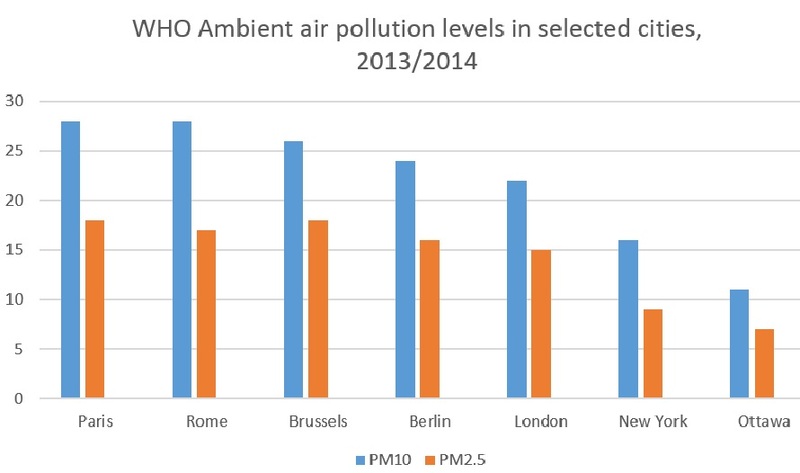 No country in the EU has a city which meets the WHO air quality guidelines. AFTER: Paris’ Rive Droite/Voie Express has been closed to traffic since Autumn 2016 as a measure to combat rising pollution. Political and residential polemic still reigns as to whether it has made that much difference, with traffic now clogging streets above. Of course. driving in by car we were adding to the problem. From now on, we take the train (strikes permitting: SNCF oblige…). Or the BlaBlaCar, or other car-sharing outfits where you can babble along – or not – with strangers, make friends during the drive in and contribute to reducing the number of cars polluting the city. Just as the global BreatheLife campaign for clean air is asking us all to do this month. What of other capital cities? 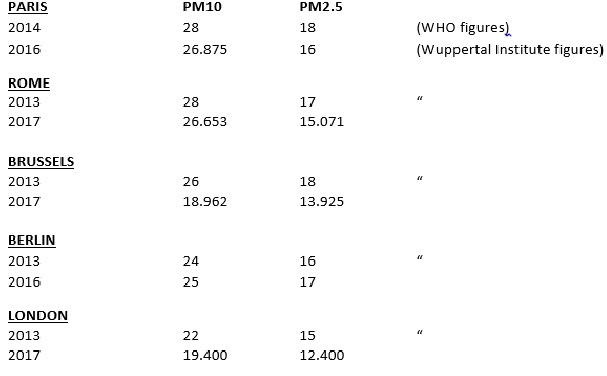 A quick comparison between WHO’s 2013/2014 figures and the Wuppertal Institute’s more up to date ones shows European city PM levels decreasing – with the exception of Berlin – even if they all remain at levels dangerous for our health. 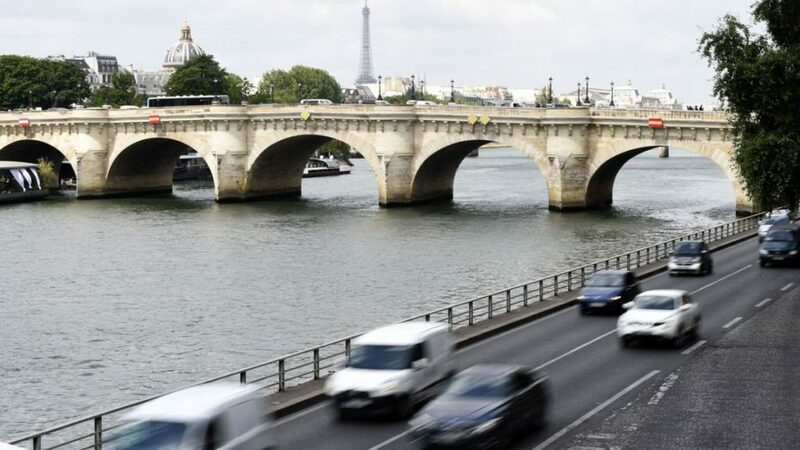 France sent to the European court of Justice for its nitrogen dioxide (NO2) levels. France as a country overall is exceeding pollution limits, and has several times been threatened by the EU for not respecting the European rules on NO2 pollution. Now she is being taken to the European court. It’s not as if the problem is new. Take a look here at the build-up. May 2011 France was taken to the EU Court of Justice for not respecting the PM 10 limits laid down by the EU. 30th January 2018, after repeated warnings, France was convened – along with the UK, Germany, Spain, Hungary, Italy, Czech Republic, Romania, and Slovakia, to a last-chance EU meeting where they were all told to brush up their act nation-wide, or else. 17th May 2018 (last month) the European Commission took France – as well as the UK, Germany Hungary, Italy, and Romania – to the EU court of Justice (CJEU) for not respecting the NO2 polluting limits. Spain, the Czech Republic and Slovakia have, according to the EU, shown serious efforts and aren’t being prosecuted – even if the EU has an eye on them. What and who is polluting throughout France? You can access EU national figures on pollutants (in 2015) and which sectoral activities are the culprits here. PM2.5 levels are relatively high in France, NOx levels however score less than those in the UK, Germany, Spain and Poland, for example. What are we risking? Our health, our lives. It is becoming a well-known fact now that fine particles (PM 2.5, PM10 etc.) which get into the lungs and cardiovascular system bring on potentially fatal diseases such as stroke, heart disease, lung cancer, chronic obstructive pulmonary disease (COPD), asthma pneumonia. WHO’s data and analysis alone gives for sorry reading. India has overtaken China as the world’s biggest polluter: northern Indian cities have pollution levels 16 times higher than London. China’s investments in clean energy, its national air pollution action plan and strict emissions standards seem to be slowly paying off with pollution levels falling 30% between 2013 and 2016. India recently announced a National Clean Air Plan but it only addresses air quality monitoring and passes the buck to local authorities to devise their own action plans. Megacities exceed WHO guideline levels by more than 5 times. around 7 million deaths per year are caused by both ambient (outdoor) and household air pollution. Highest ambient pollution levels are in the Eastern Mediterranean Region and South-East Asia followed by low and middle income cities in Africa and the Western Pacific. However, there’s a serious lack of air pollution data for Africa and part of the Western Pacific. One of the main causes are polluting stoves and fuels in homes. 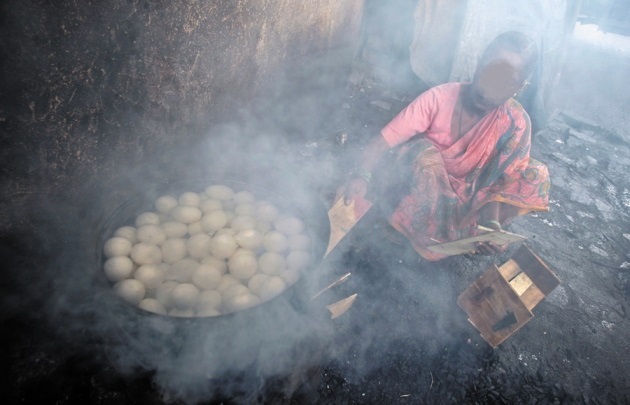 More than 40% of the world’s population (3 billion people) do not have access to clean cooking fuels which are the main source of household air pollution. So – sadly – the poorest and most marginalized people are the most effected by pollution-related diseases. And Greenpeace recently made a call to action to ditch fossil fuels, pointing fingers at the rebound in the use of coal, oil and gas in 2017. *see Living. Moving. Breathing. Ranking of European Cities in Sustainable Transport, 22 May 2018 report of the Wuppertal Institute commissioned by Greenpeace. The first Global Conference on Air Pollution and Health will take place in Geneva, Switzerland, 30 October – 1 November 2018, organised by WHO. The EEC’s final Clean Air Outlook was published this week 7 June, claiming that the number of premature deaths linked to air pollution in 2030 could be more than halved if member states applied the EU policies on emissions, climate and energy. Click here for the EU directive on national polluting emissions. NextFarmers and Beekepers together ?